The tiny Greek island of Paxos is heaven. Endless olive groves, tiny coves and dramatic cliffs. Paxos is only accessible by sea so has remained incredibly unspoilt and we have handpicked the best choice of luxury holiday villas to rent in Paxos. The smallest of the Ionian islands, Paxos is a mix of sophistication and unspoilt seclusion. It is a timeless Greek island with stunning Ionian scenery to explore where familiarity becomes one of the pleasures of visiting a small island - when you return (which you will!) you'll be warmly welcomed back by many of the familiar local faces! Victoria has become known as the go-to woman for the best luxury villas in Paxos and each has been hand picked by us for its individuality and special features. 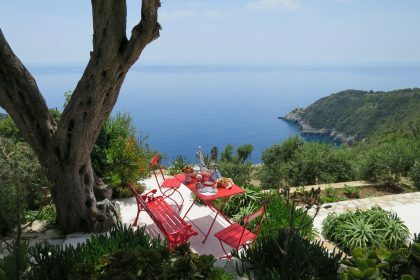 Eating out in Paxos is easy, and our unmissable list of where to go for great local food will help you. The deep golden local olive oil made from the island’s lianolia olives is unique. Try the calamari, bruschetta with feta and caramelised onions, seabass ’bianco’ as well as delicious seafood risotto. Most of the beach bars serve delicious fresh fish, feast on baked sardines or barbecued octopus. Fresh pies and bread or baklava the bakeries are mouth watering. Nearby Italy has left a strong influence and good fresh pasta is available in many restaurants. 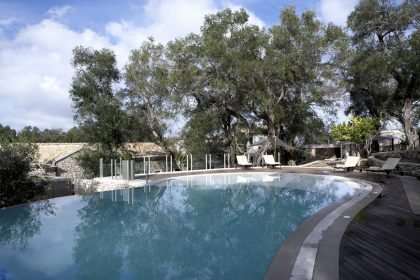 Nearly all our luxury villas in Paxos have lovely pools which is where everyone has a chance for a good swim and hearty breakfast of local yoghurt honey and peaches before venturing out to their boat and the glorious coastline of little bays and coves. Otherwise, there are beaches with bars and tavernas (some with live music). During the cooler months, the island’s wildflowers and butterflies make it the perfect place to walk or paint. There are lovely shops and art galleries for those bored with the beach! In the height of the summer dinner gets later and later. Even the children are happily out late enjoying the freedom of cool evenings in such a safe place. Wander to a bar for a nightcap or two before going on dancing. The liveliest spots are in Gaios where there are a couple of open air all night clubs and many bars. Those under 25 will love it but it is all very non-ageist and you will be welcome to join in. You can shop late into the night as so many shops are open, wonderful presents in many extremely good shops. The island is a mass of tiny paths and tracks where you can find no less than 65 Greek Orthodox churches. Many passionate walkers come annually to see the wildflowers and butterflies and try to make sense of all the hidden pathways - some of which lead to the gigantic cliffs on the west coast where the sun sets so dramatically. Getting away from modern life and getting a taste of authentic Greece. Taking a month out in spring or autumn to read, write or paint. Anyone who loves being close to the clearest, bluest sea. Enjoying outside life on the sea. Paxos is quietly and discreetly rather cool. In high season many aristocratic Italian families who own houses there arrive from Rome and Milan for August which gives the islanders lots to look at! There is a bohemian feel to the island and no one really dresses up which is very relaxing. Over the years a host of big names have visited the island and even settled there mainly because no one bothers them. There have been sightings over the years of Tom Hanks, Jude Law, Kate Moss & Suzanna York.